Sabritas Adobadas have always been a childhood favorite, and its taste grows into a nostalgic flashback to many great memories in Mexico. It's distinct flavor is combined by a mix of chile and lime. 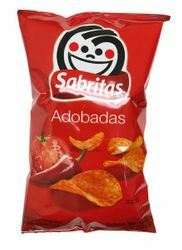 Not to confuse with Lay's Chile Limon or Lay's Flamin' Hot, because if you've tasted one, you will want more of this unique tasting Sabritas Adobadas.